Here is a pitching video of my son. There are two videos, one of the front and one of the back view. I’m very impressed by this young man’s work (and his dad’s). He looks very good. Good hip / shoulder separation at landing. Good back leg action, at least from these angles. Nice shoulder rotation and upper body action into and beyond release. Good lead arm action also. A side view would be nice to see the upper body in relation to the lower at landing. Thanks, dm59. His control has gotten better - still not great, but his velocity has really increased. I constantly coach him for control, but he likes to throw it hard - typical. His biggest tendency was to leave it high - think we have gained control over that. He still tends to throw his fast ball down and in on a righty. It looks to me that this may be caused by a little too much over rotation at the beginning - probably trying to throw it hard. Then, it seems in the effort to get back in line he over rotates the other way, causing him to release late. His fast ball in around 83 (tops), but he is still only 15. His changup and curve are really coming around. Right now his is about 5’10" and 165 lbs. We are throwing long toss 2/3 days a week and off the mound 2 days. His long toss range has gone from 200 ft to around 260-270 in only a few weeks. We never really threw long toss until recently. It seems to be helping some with overall arm strength. All replies are welcome - any advice will be greatly appreciated. I immediately noticed one thing. In the rear view, if you stop just after he breaks his hands (send me the source and I’ll give you the exact frame) you can see that his wrist is hooked pretty severely. I know that Barry Zito does it and it works for him, but for many guys this can cause control problems. I know it’s a huge problem for one of my strongest 11 year-olds. He has a hard time with consistency and I think a lot of it is due to how he hooks his wrist. I’ll look at it more if I can. I noticed the hooked wrist also but I don’t believe it’s a problem. When the arm lays back to full external rotation as the shoulders square to the plate, the hand takes care of itself. The hooking issue is long gone. Overall, I’d say not bad. But there are a few things I noticed that I’d suggest working on. Observation 1: Pitcher stands very upright and then takes a big dip at the start of the stride. Observation 3: Pitcher sweeps his glove across the front side. Observation 4: Pitcher’s head darts to the right right before release. Observation 5: Pitcher’s back foot lifts off the ground right at release. Observation 6: Pitcher’s drag line appears to be very short if existent at all. The big dip at the start of the stride causes the eyes to move and can result in a shortened stride. Keeping the weight back and not getting the hips going sooner will also result in a shorted stride as well as making you take longer to get into foot strike. Taking longer to get into foot strike causes you to have extra time on your hands to get yourself into trouble. For example, you have time to sweep the glove which can lead to early rotation and/or over rotation of the shoulders (i.e. inconsistency of release point). The head movement right before release point will pull the release point back and will contribute to inconsistency of release point. My concern is that it may indicate tension in the wrist which can make the release point inconsistent. BTW, the hooking is especially prominent around the 41st frame. I also noticed in the front view that he seems to land mostly on his heel, which in some cases can cause control problems. I would prefer that he landed a little moe flat-footed. It took my son a while to get it down since he was used to having the ball face centerfield like in this photo. We have corrected the problem and also worked on the hips. Other than that he looks good. I guess you are a person that would suggest long toss as well. I have been a huge fan of it and I’d recommend it to everyone who wants to pitch. Good job and keep up the hard work. I also do not have a problem with the hooking as long as everything is right at footplant! Hasn’t been a problem for the Cy Young Winner Barry Zito so it shouldn’t be a problem for you. This was a photo that O’Leary put up. Kind of shows you what I am trying to say from a lefty point of view. Roger has a point about the lack of rear foot drag. I’m going to send you a clip of Clemens that shows very well how he uses the back foot to drive the extended back leg into the right hip, fueling rotation around the left, stationary one. Your son’s missing this little detail. [quote=“Roger”]Observation 1: Pitcher stands very upright and then takes a big dip at the start of the stride. [/quote]Sorry Roger, I don’t see that. A side view would help though. [quote=“Roger”]Observation 3: Pitcher sweeps his glove across the front side. [/quote]I think you’re coming from the point of view of House’s recommendation to point the glove at the target, which I don’t see as a necessity. The action this young man exhibits is not much different than a huge number of pros. He might drop the glove a tad early but this isn’t opening him up too soon. [quote=“Roger”]Observation 4: Pitcher’s head darts to the right right before release. [/quote]You and I have had this conversation before, Roger. I feel that this is a natural motion given the arm slot he’s using. I also don’t see it “dart” to the right but move over a 5 frame time period with shoulder rotation. If the head does not move to the right, the shoulders cannot tilt in order to allow for the desired arm slot. It would flatten out the arm path. [quote=“Roger”]The head movement right before release point will pull the release point back and will contribute to inconsistency of release point. [/quote]There’s no cause and effect relationship here. Check the pros. Just watch the top of the pitcher’s head. Compare the height to some adjacent object and then watch how much it dips as he strides. Time spent going up or down is time NOT spent moving towards the target. It moves the eyes which are supposed to be focusing on the target, it might affect balance and posture, and it makes you slower to the plate. Furthermore, for all the guys that believe in tilting the shoulders to get a higher arm slot and throw with more angle, it lowers the release point and reduces that angle. I’d think those guys would be more concerned about this than I am. [quote=“Roger”]Observation 3: Pitcher sweeps his glove across the front side. [/quote]I think you’re coming from the point of view of House’s recommendation to point the glove at the target, which I don’t see as a necessity. I’m not sure if you actually meant “pointing” the glove at the target. House doesn’t recommend pointing the glove at the target. He only recommends getting it out front and leaving it there. The arms need to he in an opposite and equal position at foot strike and then the torso moves to the glove. The glove can be pointed at the target, tucked under, hooked to the side, what ever. Regardless, it’s not about pointing the glove at the target - it’s about not sweeping because that can lead to problems with shoulder rotation. The fact that the pitcher has time to sweep the glove means he is not getting to foot strike as quickly as he should. The action this young man exhibits is not much different than a huge number of pros. He might drop the glove a tad early but this isn’t opening him up too soon. Well, these video clips represent contrived situations. Maybe he didn’t open up too early in these two video clips because he knew the camera was on him. But pitching is all about consistency. When he’s not performing for the camera and he’s in the heat of competetion, will he still stay closed? Maybe. Maybe not. I’d prefer to increase his chances and, to me, eliminating the sweep is appropriate. But is there not an effect on the release point? Again, what are the pitcher’s chances of getting a consistent release point with the late movement of the head? The head movement usually causes shoulder movement. Pro pitchers have gotten to where this movement is fairly consistent. With the young pitchers I work with, it’s tough for them to have this kind of movement and still be consistent. So I opt for eliminating the movement. OF course, I don’t teach tilting the shoulders to acquire some desired arm slot. 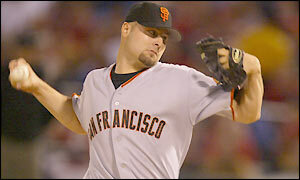 I teach throwing with the arm slot that feels the most natural when not tilting the head and shoulders. Different stroke for different folks, I guess. I don’t see a problem here. This helps him powerfully rotate his shoulders. Yes, I tell my younger guys to point the glove at the target, but more advanced guys should generally point the glove behind the batter because that increases how much their shoulders will rotate. [quote=“dm59”][quote=“Roger”]Observation 3: Pitcher sweeps his glove across the front side. [/quote]I think you’re coming from the point of view of House’s recommendation to point the glove at the target, which I don’t see as a necessity. The action this young man exhibits is not much different than a huge number of pros. He might drop the glove a tad early but this isn’t opening him up too soon. From what i’m read this is what youre saying. Am I on the right track? As the picture above shows, very few pros actually point the glove directly at the target (however, many do point their glove side upper arms at the target). Notice how by doing this his shoulders are even more closed (e.g. pointing to the 1B side of the plate) than they would be if he was pointing the glove at the target. This increases the amount that the muscles of the torso will stretch as the hips open up underneath them and increases the force with which the shoulders will be pulled around. That is what I mean when I say that you should throw with your body and not your arm. I tell my younger guys to point their gloves directly at the target because it enables them to generate enough force to throw hard but not so much force that they could end up hurting themselves. Notice how by doing this his shoulders are even more closed (e.g. pointing to the 1B side of the plate) than they would be if he was pointing the glove at the target. This increases the amount that the muscles of the torso will stretch as the hips open up underneath them and increase the force with which the shoulders will rotate. So having the shoulders closed longer is a good thing? It is ABSOLUTELY CRITICAL to velocity. This is one thing that Tom House and I agree on (he calls it Late Torso Rotation). [quote=“SchillingBeckett”]So having the shoulders closed longer is a good thing? Actually, he calls it “late shoulder rotation”. The term “torso” normally includes both the shoulders and the hips so that would be more confusing since we’re interested in the shoulders rotating separately from the hips. [quote=“SchillingBeckett”]So having the shoulders closed longer is a good thing? [/quote]Oh yes!!! [quote=“Chris O’Leary”]I tell my younger guys to point their gloves directly at the target because it enables them to generate enough force to throw hard but not so much force that they could end up hurting themselves. [/quote]I’ve never liked the idea of pointing the glove at the target. Kids I’ve coached tended to let the glove drop early and supinate, thus opening the shoulders too early. That glove held way out there at the end of that lever is a weight that just WANTS to drop. With younger kids, I prefer to tell them to site along the upper arm by pointing the elbow. As they progress, I ease them into a more horizontally oriented movement with the elbow.